Imagine being back at a place you haven’t been to in a long time. Maybe it’s a classroom, a childhood home, the roof of said childhood home, or even the back piano bar of a long-gone restaurant. 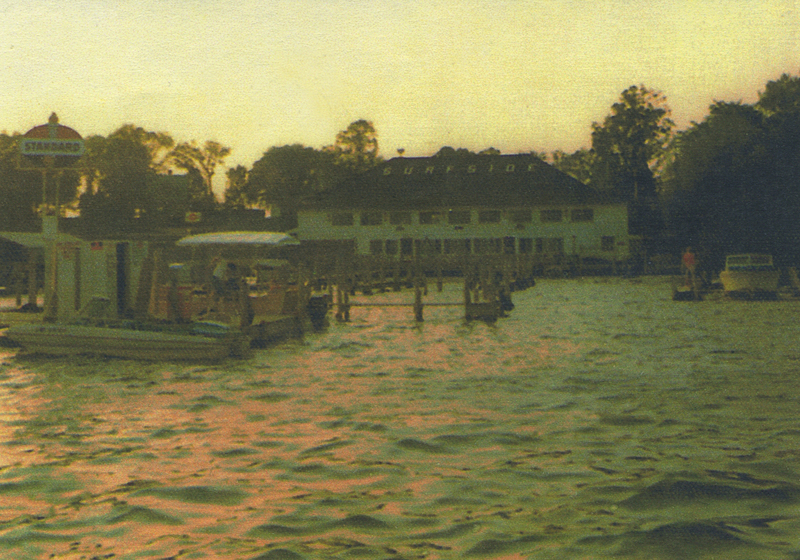 The latter would be Surfside (at left and below, courtesy of Mr. Tom Rockvam)—which overlooked Cooks Bay on Lake Minnetonka, near the intersection of Commerce and Bartlett Boulevards in Mound, Minnesota. It was torn down in the spring of 1985 to make way for luxury condominiums. Saturday, Feb. 10, 1979, the journal reads: “I drove out to Surfside and talked to Geoff for a second…” Geoff Morrison worked in the kitchen there after we graduated high school in 1978. We’d become buddies while attending the University of Minnesota that winter. At the time, Surfside was owned by Butch Essig, brother-in-law to Geoff’s girlfriend Dannette, a lovely, whip-smart older blonde. 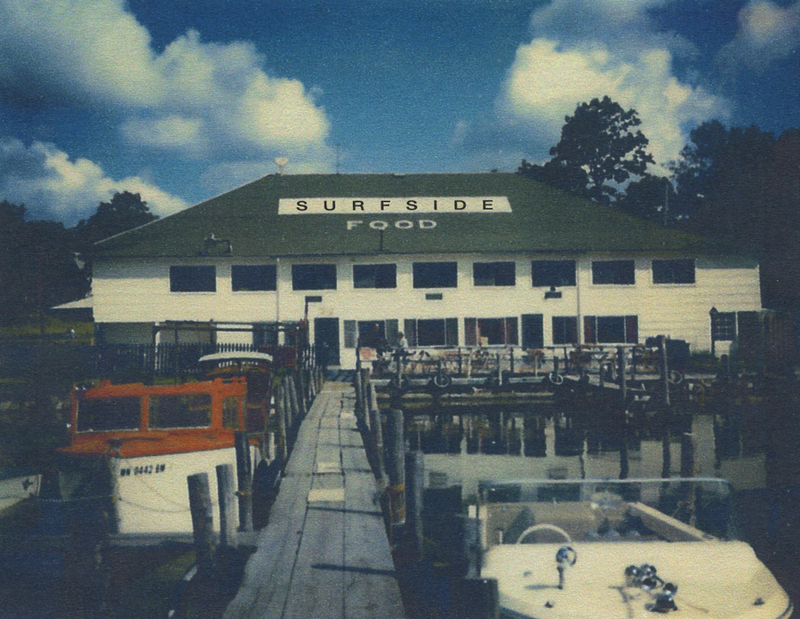 Surfside always hosted our high school’s Homecoming pizza parties, since they could contain all the underage drinkers upstairs, away from the bar downstairs. I loved those meditative drives around town, or out on back farm roads, where I fantasized about story scenes and characters. With the radio or cassette player blasting, I was completely in the zone. The Spring Park 7-Eleven was the hub of high school activity any given Saturday night—the place to go when ideas were running low. “When I pulled up, Michelle was walking out after paying for some gas. I ran up and we grabbed each other, arm in arm, laughed, ‘Michelle!’ ‘Michael!’ It was really great. I put the gas in her Monza … she said, ‘I wanna read your book when it’s done!’” She had to go, since she was meeting up with her friend Julie Bialon for a midnight movie. So, here in late October 2013, I imagine being in that space again—outside the 7-Eleven before midnight on a wintry Saturday night in 1979, energy flowing between me and Michelle—but it’s like a scene in a Michel Gondry film—no past, no future, just a present quickly dissolving even as it’s happening. “…Michelle and I were lying together on her bed, on the verge of making love. It seemed that she was seducing me. Well, in the dream, her Mom walked in on us (I don’t remember her reaction—it wasn’t big). Anyway, Michelle’s ‘stepfather’ (she hasn’t one) came in on us and he was really mad, bitched us both out and I argued that Michelle’s true father, who I knew, wouldn’t have minded if we were together. The dream, the story, isn’t what’s important—it’s the idea of Michelle, how she secretly has me captivated and can play upon my emotions as she pleases. ~ by completelyinthedark on November 1, 2013. I remember falling through the ice at Surfside as I was walking home from school in 1974. It was an unseasonably warm winter’s day and Bryan Hagen and I were cutting across the bay towards home. I failed to give the red fence around the open water a wide enough berth and the next instant was in the drink. The ice was breaking apart in my hands as my heavy boots and parka were filling with water. Bryan, in the grip of an adrenaline rush, pulled me completely out of the water and set me down on the ice. We went into Surfside to call for a ride and the manager started yelling that I couldn’t come in the restaurant soaking wet. I looked at him and said, “You’re gonna have to move your fence”. Then he was nice. A better time was had seeing The Trashmen play the upstairs ballroom c.1979. Good to hear from you, Scott. Yeah meany fond memories of Surfside that’s for sure. I also fell through the ice outside the Surfside, while my mom was there .. I was chasing the geese .. Wow .. Seems it wasn’t to safe out there .. Ya think ?